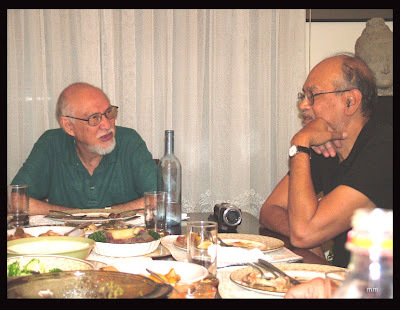 Even after Big Bang of Filipino diaspora that launched millions of satellites of skilled Filipinos all over this vast economic universe, molten core of Philippine culture still bubbles hot, powered by an almost unending supply of fuel enriched not by physicists but master Filipino artists and writers. Some have even been given prestigious awards of achievement as National Artists by the Philippine government. Filipinos abroad, like myself, who seem stuck in an asteroid belt of standardized comfort often find themselves warmly irradiated by less stressful economic challenges. However there's still this cold chill of a Filipino cultural vacuum in their adopted lands. The Philippine Media knows homesickness constantly afflicts Filipinos abroad thus providing vicarious reality, perhaps filling up gap and emptiness. Ergo, music bands and artists from Manila come and go, rarely missing a weekend beat; and with the convenience of the home computer a little window like YouTube's squint screen makes low res out of streaming reality (even if in full-screen, the resolution is terrible). Currently there are available satellite-beamed Filipino shows that may also bring poignant laughter to many; but not unlike a visiting comet it’s quite rare to get zapped by Tesla's lightning bolts from fuel rod of a master Filipino artist. Make that National, and BenCab set foot briefly in Sydney. His energy released a radiation that lit up Ding’s place in French’s <?xml:namespace prefix = st1 />Forest during that beautiful evening in Yellow Cake country. First time I've met Philippine National Artist Dr. Benedicto Cabrera (aka BenCab) although he's familiar with me due to common friends like Pandy Aviado and Krip Yuson. 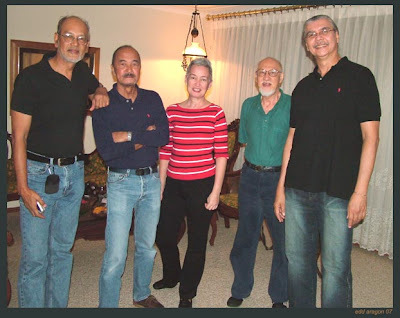 Lucky again for us to get invited to the home of Alfredo “Ding” and Irene Roces, now a traditional artists’ rendezvous. Ding is long-time friend of BenCab and has offered his cosy pad for the night before the guests head off for Queensland next morning. I started the sketch (which I intended to give him) with quick scribbles while my left hand grappled for the record button of my old and trusty, little iRiver mp3 gizmo. Haha - There’s nothing wrong with Philippine Art – everybody has his own direction, and we’re not limited to… you know – like art now goes in different directions, from painting to installations and performances.. Okay there’s nothing wrong, but doesn’t it make one wonder why Philippine Art is not as big as Western Art; could there be a cultural hype problem there? What do you think? We’re not as dominant as western art when it comes to pushing our culture with the help of the government – it’s that you’re really on your own – but a lot of our artists have been recognised already. Would you consider the Philippine jeepney an inappropriate icon for Philippine Art? Rather.. would you consider it kitsch? It’s quite a – it’s just a novelty although it is very practical in the Philippines to use it, but still I think that it’s a hindrance also. Why is it that some people insist in representing the Philippines through functional icons like the Philippine jeepney? Could we think of a better substitute? Our culture is quite a mixture – so it is the halu-halo (a Philippine ice treat) – everything really. I don’t know why - (it’s so entertaining to watch you draw ha-ha-ha) . Yeah, its been used as an icon – but that boils down to the war – how creative we are in using the GI jeeps – to a practical passenger you know..
He-he sorry to bother you with trivial questions. What’s keeping you busy now after your recent paper prints and pulp painting workshop in Singapore? I am setting up a foundation, and putting up a museum, a personal museum, where I have a collection of primitive art – it’s not really primitive art – but the art of the Cordilleras. I think this is the true Filipino art because it is not influenced by Christianity, by foreign .. you know ..
Who’s helping you with this project – other artists in the midst? No, not yet. I want to build the building first. And then I need a lot of help, of course – I need a good curator, manager, things like that. It will be a collection of Cordillera art and my collection of contemporary art – young artists, and also, of course my own work. I see you have a close affinity with the mountains of the Cordilleras. Yes, like I said I admire the art of the Cordilleras because they are quite complete - they are farmers, carvers, carpenters, they do basketry – it’s an all around type of artistry. If the Philippine economy is good, would our art scene be good, too? True. Aboriginal art now is expensive – especially in New York . Any comment? Yeah – they try to protect their images – which should be – it should not be exploited. The country should be the one to benefit from it. How may this national artist inspire or help Filipinos? Would it compel you to be more creative? In a sense, I am busier of course, and there is more demand for what I should be doing. I like your philanthropic approach. Err, why are you here in Sydney? To visit Ding Roces and you guys. I have a sister in Brisbane, and this is the first time for me to visit Australia…and my cousins and uncles. I am staying quite short – but I am thinking next time I should stay longer – there is a lot to see here. Got any words of wisdom for the young Filipino artist anywhere in the world? Well actually, hard work, discipline and then good networking – networking is very good for – if you want to go out of the confines of the country. Any latest books about you? There are no books written about me. I have that coffee table book – I came out with that book about my collection of lamp containers from the North, aside from the bulos and basketries, you know. You’ve been travelling extensively and just flew in from Singapore. Going back to the Philippines soon enough? Wow! And it’s gonna be mainly Cordilleras art? Yes, and contemporary art, too. And of course your recent and old works? No, I call it a collection – not published yet. Oh did you see my book – Rock Session? We did a whole 70 drawings of Pepe Smith, Joey Ayala, Wally Gonzalez and other younger singers. Oh I’m so glad a lot of people helped Pepe get out jail. Ha-ha-ha, of course, museum will be completed in 9 months – it’s an open invitation for you to come. It would also be open for tourists – there will be an entry charge - for maintenance. Salamat rin Edd. Thanks for your drawing! I like it! 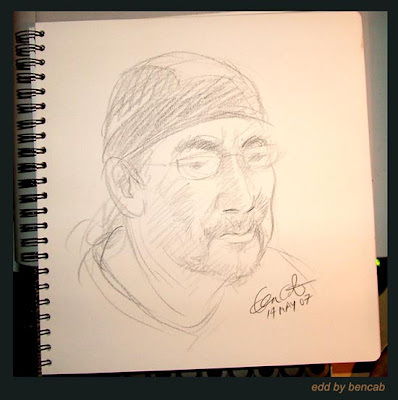 Later that evening, BenCab drew me a sketch, too which I’ll now forever treasure (above). “Benedicto Reyes Cabrera --- or BenCab, as he is more popularly known is widely hailed as a master of contemporary Philippine art. 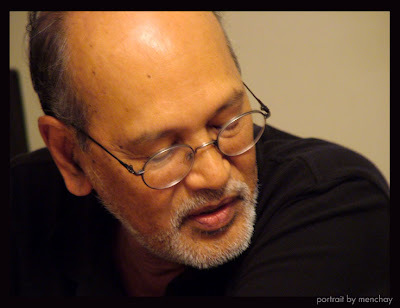 He was born in Manila on April 10, 1942. 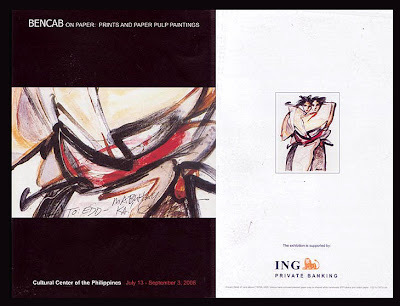 BenCab began carving a niche for himself in Manila's art circles shortly after receiving his bachelor's degree in Fine Arts from the University of the Philippines in 1963. In 2006, he was conferred the Order of National Artist for Visual Arts by President Gloria Macapagal-Arroyo in Malacanang Palace. 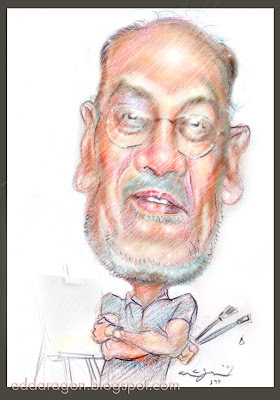 His works have been the subject of three books, Ben Cabrera: Etchings (1970-1980) by Cid Reyes; Bencab's Rock Sessions by Eric Caruncho; and BENCAB by Alfred Yuson and Cid Reyes. thank you for sharing us a bit of BenCab. bencab is my type of artist. Great drawing Edd. Hope you remember me...cruised by this item. Bencab is always the great humble Manong. 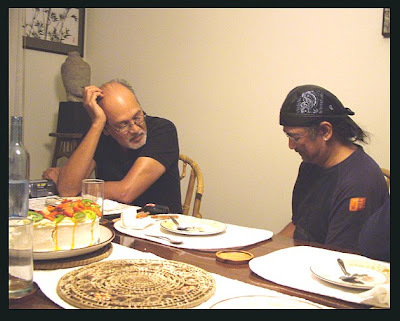 Good to see old greats together especially my first real inspiration to accept myself as an arist, Jon Altomonte.